Hi. My first post here. I'm "restoring" a 1985 fiberglass Thistle, hull #3227, beginning with rigging, etc. so that it can be put in the water and evaluated further. One of the items, among many, is what to do with the holes pictured below in the transom. I assume they are there for bailing but some hardware is missing, I believe. I have been searching "sailboat scupper drains", sailboat self-bailers", etc., with no luck. It seems to me I have seen pictures of these large square bailers on sailboats before but can find nothing for sale that will work. The holes are 3.25" diameter. The boat has its original mainsail but no jib or spinnaker so I would be interested in buying a used jib and/or spinnaker. Those two large holes are for draining water in the event of a capsize. Not all Thistles have them. They can be covered with wide range of materials including duct tape or sail cloth with the covering removed in the event of a capsize. Other designs are some kind of hinged flaps. There are plenty of Thistles in your area so the best is to get in touch with the local Thistle sailers and see first hand a few boats. These people can also hook you up with some good used sails. Okay, thanks Alan, will do and thanks for the picture links. I have a set of Thistle Class Plans coming from the class site that supposedly shows all the rigging. My previous experience sailing has been with Hobie cats and Sunfish so I am blown away with the amount of rigging and controls present on the Thistle but I'll get it figured out. You can rig your Thistle as complicated or as simply as you desire. There is no right or wrong way! Again, the best is to connect with some Thistle sailers in your area. It's a great boat although some think it's a water born torture rack when it comes to comfort! To each his own. If you go the racing route you'll find the competition is at the highest level. I doubt if the class plans will provide the level of detail with regards to rigging. The plans will show all of the dimensions and components. The class handbook, aka "green book" provides a lot of info regarding what you can and cannot do. You'll get a copy of the green book when you join the class. There is an active fleet in this part of NC supposedly with a winter season on Jordan Lake about 30 miles away, beginning in November. 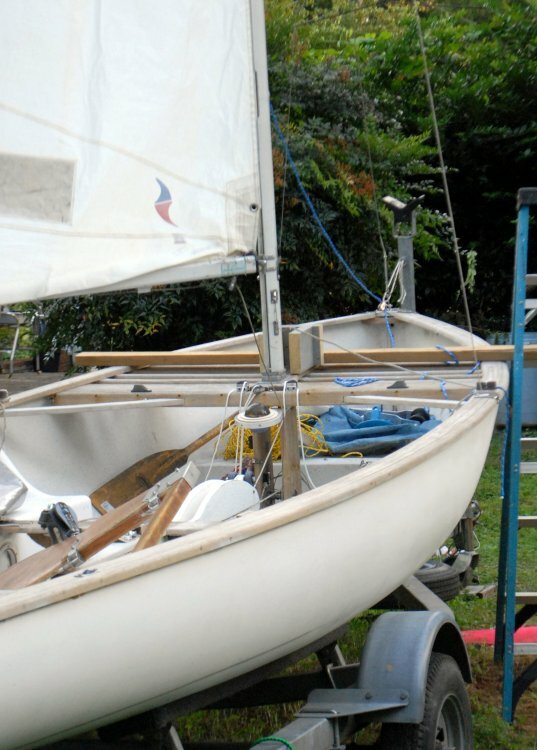 I hope to be ready to do some sailing this Fall or at least connect with some Thistle sailors to get some help as you suggested. I'm itching to get it in the water just to see what's what. Can't lower the centerboard more than a few inches with it on the trailer. With the question of the rear "bailers" answered, thanks to you, I will stop worrying about that. I see now that the holes are actually an inch or two above the water line. 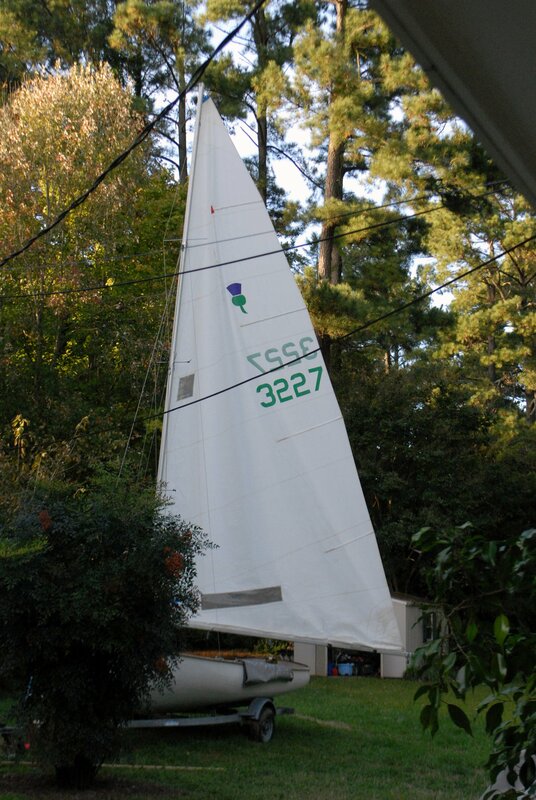 All that's left now is a mainsail halyard and I can at least put it in the water and check out the centerboard function and sail around a bit, mainsail only. The hull appears to be in good condition but you never know. I will choose a moderate day to take advantage of the thistle's good low wind performance while I get used to it. 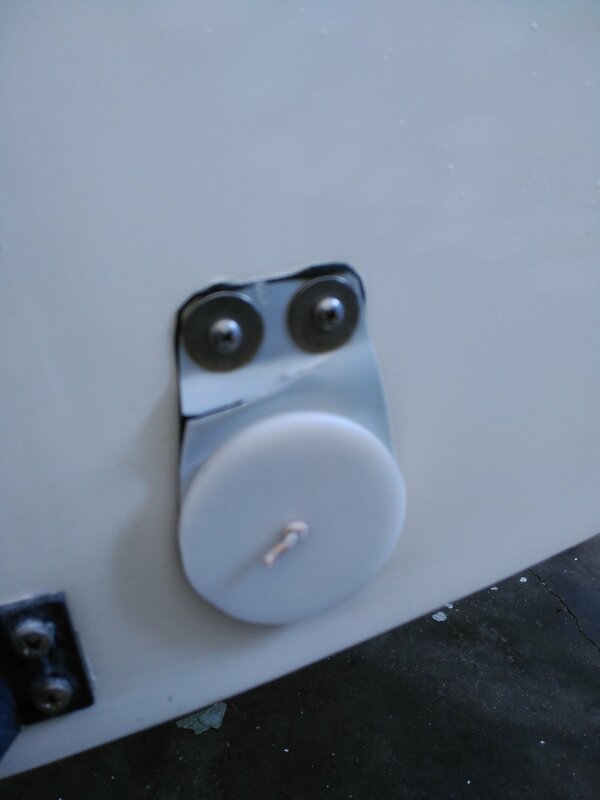 Your gonna want to cover those stern bailer holes during sailing, they will take on water. Many other classes have them, 505's, Finns, Lightnings, etc. Usually they are covered with a thin plastic or film and taped at the top. Often bungee running though and sent to a cleat for release in the event of taking on large amount of water. May not be necessary depending on how high above the water line. Our local club's CFJ's have similar up, with tennis balls. Check post number two for a picture. take one tennis ball, cut in half, hole in each half with bungee through the hole to a suitable place up the inside that you can de-tension. 2 thistle salors own the Crosswinds marina at Jordan Lake. Go launch there and you may get some help if they happen to be there that day. Great news! I'll check it out...thanks. I can definitely handle some kind of home-made solution. I'll stop looking for off-the-shelf items. I've seen this solution suggested and actually found a tennis ball with cord offered for sale on line but the holes in my Thistle are a bit too big for a tennis ball. I will remember to put a loop in the bungee as shown if I do something similar. I have seen Simple Plastic funnels being used for this purpose. suggest you go to your local toy shop and find a suitably sized rubber ball.. or as delta suggests, use funnels. The good thing about something tapered, as opposed to flat, is that it self-locates in the hole. Flexibility helps with sealing the hole. 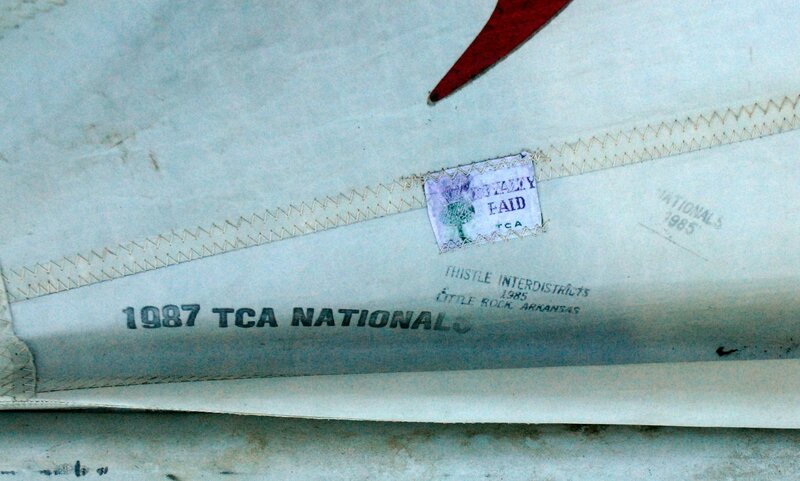 A typical treatment is sail repair cloth (insignia cloth sticky back) It's a break in case of emergency bailer, can't really recommend leaving them uncovered for any length of time, you may swamp just hanging your rudder after you launch! I built up plexiglass hinged flaps to survive ramp launches, overkill, probably but it works. Funnels faced with neoprene, worked slick on Humber lifeboats that we launched through the surf. Oh and on the sails, now is the Fall discount on new sails , so hit the class mailing lists and website to see if someone is selling year old (or few year old) sails as they order new for next season. Thistleclass.com and you can search out the yahoo group for email. Here's from behind: a piece of neoprene (old wetsuit), plastic (a radiography will work) and a plastic plate a bit larger then the hole and similar shape and a piece of line threaded through it. When a Thistle swamps you kick out the transom flaps after righting the boat and then a powerboat tows the boat until most of the water exits through the holes. You've had outside assistance so at least that race is over. Would you ever open the flaps without a tow? Seems anything more sophisticated than tape or Insignia cloth is maybe more effort than required? Sounds right to me although I have no experience. I'm just looking for something right now to keep water from coming in when I launch the first time to evaluate although a permanent solution would be preferable, I suppose. I was thinking about something like that but is the "flap" necessary? I guess it could get knocked off center, otherwise. The downside to the Thistle, supposedly, is that it's lack of decking (it's basically just a shell) while reducing weight means that a lot of water can be taken on in case of a capsize. I don't know how much "accelerating" one would be able to do with a hull full of water. I see the transom bailers useful only with a partial load of water. Mine also has a couple of the small mid-ship rectangular bailers. With that in mind is it practical to have at least one of these bailers aboard with the hope that, with patience, enough water could be removed to allow some headway? ^that's what I was getting at. Have seen Thistle getting towed dry a few times and they usually pack it in for the day afterwards. Sounds like you are up to speed on the possibility at any rate. I've capsized a glass Thistle once. This boat had transom flaps but also had good floatation. We righted the boat pretty fast, opened the normal bailers, got on a reach and were dry in about 5 minutes. Never opened the transom flaps and didn't need to bail. Key points 1) boat (an old D&M) had good floatation and 2) waves were not a problem. Not all Thistles have transom flaps. I'm restoring an old woodie and have opted to not install flaps. Key thing is adequate floatation, especially on woodies but even older glass boats can have problems (cracks in the bonds the tanks to the hull; not enough foam inside the tanks). Air tanks alone are not allowed - the tanks must have foam inside. The OP is recommended to take a careful look at the tanks (bow, seats, under the aft gratings) and make sure all are in good shape. From my experience when you see a Thistle being towed in after a capsize the problem is usually poor floatation. There have been several discussions within the class both in the class magazine (Bagpipe) and on the list-serve over the years. Interesting and encouraging. The side chambers on my glass Thistle have foam inside, the back chamber has a small handful of foam "peanuts" and I don't know about the front. I don't see any obvious cracks where the chambers join the hull although I had already been thinking about running a small bead of urethane sealant at that point. Also the chambers have, along with the large threaded round access holes with covers, about a 1" diameter hole strategically placed for drainage. So much for air-tight. Class requires at least one 2.5 gallon bucket, I carry 2! Typically after a bad swamping the centerboard trunk is at/bellow waterline and the rails at the transom are almost awash as well. Step 1 is generally to bail like crazy to get the centerboard trunk above water (stuffing a spinnaker or other material in the slot is a sometimes solution to make it easier) Then you can start to sail it dry. In a seaway with any waves you may still be taking on too much water over the rails aft to make headway, this is where there transom flaps help, pop them open and get the water out fast! Good stuff, thanks! All info appreciated. I have left the scupper drain question for the time being in favor of other tasks especially the trailer which has no lights or winch. 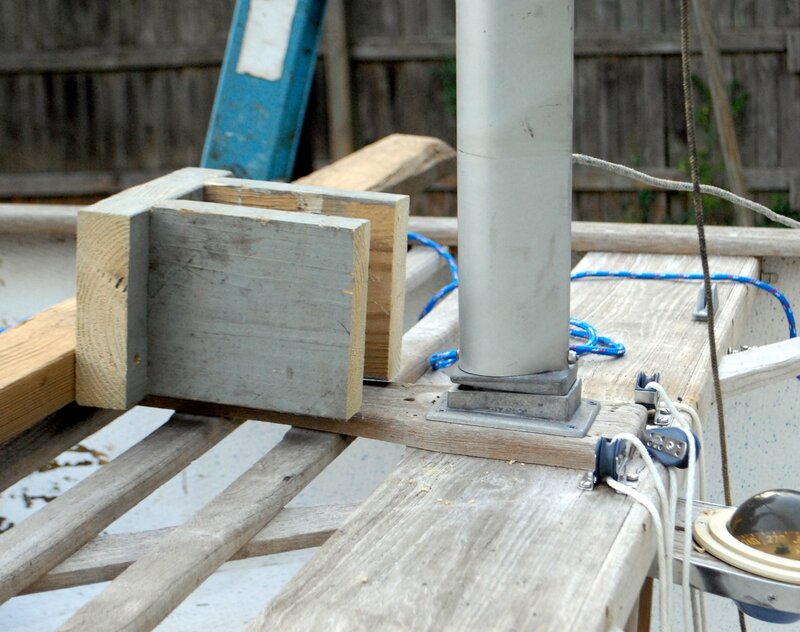 I did get the mast and sail in place using a homemade device to place the base which is not hinged. Exciting! Mast is really tall. It seems to sag toward the back going by the distance between the boom end and traveler. There is a turnbuckle on the forestay which I suppose can take care of that problem. Hopefully I'll complete the trailer lights today and all that will be left is the installation of a front trailer hitch on my truck so I can maneuver it in and out of my tight back yard, a tiller extension, and the mainsail sheet. Can't install the winch until the boat is positioned farther back which won't budge dry on the trailer. I guess it will need to be floated off. The deck stepped mast is daunting but not as hard as you think once you get comfortable stepping over the thwart while pushin it up! Also if you are on your own you can use one the two foresail halards as a safety line/temporary forestay by tying it to a bow line or a line attached to the trailer. Use whichever halyard you can reach and tension easier! The other still serves as a hinge. Good idea! I can see my jib halyard pulled all the way up the mast. Out of sight, out of mind. I'll try what you described next time. Yes, mine has the forestay tensioning device just as you described and I could put it in a different hole since I believe it's in the hole closest or near the base of the lever but since there seemed to be plenty of room for adjustment in the turnbuckle I was considering that. I used a small line and block attached to the trailer front and the mast about half way which allowed me to push and pull at the same time. Now that I've done it and I know it's possible it shouldn't be nearly as difficult next time. Check the rake first with the lever on as is, Thistles basically two-block the main much like a laser at max trim (the boom block and traveler block touching) I have a little more space then that so I don't quite two block in at the 27 foot rake measurement, every sail cut is a little different and since you can double check as you did by putting it up and seeing what happens when you sheet it tight. You don't want it to two block before your sail is tight though so it may take some experimentation. Oh and I have a 100' ribbon type tape for rake measurements rather then the self retracting kind, the ribbon ones usually have an open bail on the end you can tie the main halyard too to haul it up to check rake. I'll check that measurement first before I do anything else if I can figure out a way to get my jib halyard end back down. I have a 100' cloth measuring tape to use. This is how I was going to rig mine. It has the blocks on the boom to do it. I see what you mean about the becket-block. There are actually more pictured online without the becket-block than with now that I know what to look for. I like the plain block solution better, nice and neat, but I'll live with mine for the time being which has the becket-block. Have to learn how to tie a bowline. In the water yesterday for the first time. After a last minute, unplanned replacement of the trailer jack I took off for a local lake and launched only to discovered that the rudder must be hung before the handle is attached. I loaded it assembled so good thing I had a paddle. Fifty yards back to the dock, up to my truck for a screw driver, and start again. Centerboard raised and lowered properly, something I never could establish since it had never been off the trailer. I left it at half way since I did not intend any close reaches with a boat I was single-handing and for the first time. Raised the sail only to discover that I had left the glove I had been using to force the main halyard into its keeper ashore so I had to make do with a mainsail stopped 8" from the top which meant that the boom sagged and made for irritating tacking. By this time it was getting late but I had about an hours worth of sailing in 7-10mph breezes, just right for a trial run, and even with mainsail-only I found the Thistle to be a quick and responsive boat and a lot of fun. A downside is that I have some leaks as shown in the last picture that by the time I reached shore probably amounted to five gallons of water on the floor. The two holes pictured I assume are screw holes which I should be able to stop with rubber washered screws of the right size. The other location looks more troublesome and will need some more work. Any suggestions about these leaks? My solution for closing off the scupper drains is pictured below. I had to buy 10 of those funnels to get the four I needed so if anyone wants to try plastic funnels I've got some. The two holes pictured I assume are screw holes which I should be able to stop with rubber washered screws of the right size. The other location looks more troublesome and will need some more work. Any suggestions about these leaks? Congrats on getting on the water! Early snow so we're skiing out here in SW Montana. Those screw holes could be filled with silicone or thickened epoxy. If there's already silicone in the holes, it's gotta be completely cleaned out or nothing else will stick. There's no need to fill those holes with screws. The cracks are definitely more troublesome. Did you see water entering through those cracks? I'm a wooden Thistle person so can't speak with a high degree of experience on a glass Thistle. However, I do think there can be wood under the glass in some areas around the CB trunk. This could depend on the builder of the boat. Best to check with a local Thistle person / someone with glass Thistle experience. If there's wood under the glass and water is coming in through those crack(s) you may have a few new challenges. Nationals next year are next door. Hope you can make it. No, but I'm very interested in getting some. No responses back from the thistleclass classified section but all offers are pretty old. I hoped to see some new offers this time of the year but nothing so far. Carolina Sailing Club's Winter racing season starts tomorrow on Jordan Lake, about 45 minutes from my house. Not advertised as a Thistle event but Dex Sawash in this thread says that the owners of the host boating center are both Thistle sailors. The internet is great but maybe I need some face time to get some leads on sails. Planning on going tomorrow. Idaho? Love to, I was born in Washington state, but that's a little too far. I definitely saw water coming in through that crack until toward the end of the sail the crack was under water. I'm thinking now a little cleaning and some nice fresh duct tape over the crack to at least slow things down a bit and allow me some more Fall sailing. Can you see the area inside the CB trunk where the crack is? Is that the rear of the trunk or the front? Just trying to figure out what force may have caused the crack. You can just bung some of the plumbers epoxy that looks like a big tootsie roll in those screw holes, not the "right" way to do it but doesn't add a mystery chemical/goo that may inhibit a proper fix later like tape or sealant might. Pending discovery of the cause of the crack, plumbers 'pox or JB Weld might be a temporary "fair weather only" "buy it at walmart" solution. Yes, we usually get a few Thistles out. I'll be out there, albeit on a laser. see you there! Thanks for the jib offer, I've been eyeing some Hobie 16 jibs on ebay. Similar luff and leech but foot is about 1.5' shorter. If I don't get a chance at some Thistle sails pretty soon I may get up with you. Crack is toward the back of the trunk and can't be seen through the trunk from above. Yeah, I don't know how it could have cracked there. Can you see up from underneath? Maybe jam a phone camera up from below? I know nothing about Thistle but since that is the rear, I don't think there would be any normal sailing loads in that area. Maybe crew just fell hard against the trunk and overstressed it which may mean a superficial repair would be ok. Do you have fiberglass skills already? Grinding out all the damage and tapering the repair into undamaged solid structure is the right way. You just need to address any construction deficiencies that contributed to that failure if there were any. That's a pretty easy place to learn, no slick surface or nonskid to duplicate. Edit- Is there a trailer roller directly under that spot? Reasons for crack damage: lifting boat full of water (there is usually a hoist point on the trunk back there, or standing in the boat while poorly supported (stress or tipping the trailer)! Slamming down on the transom isn't good for boats we've all done it though wandering too far back in the boat on the hard! You will likely find 1/4 round wood behind that cracked glass, then the CB trunk glass behind that water coming in means probably both layers are cracked. 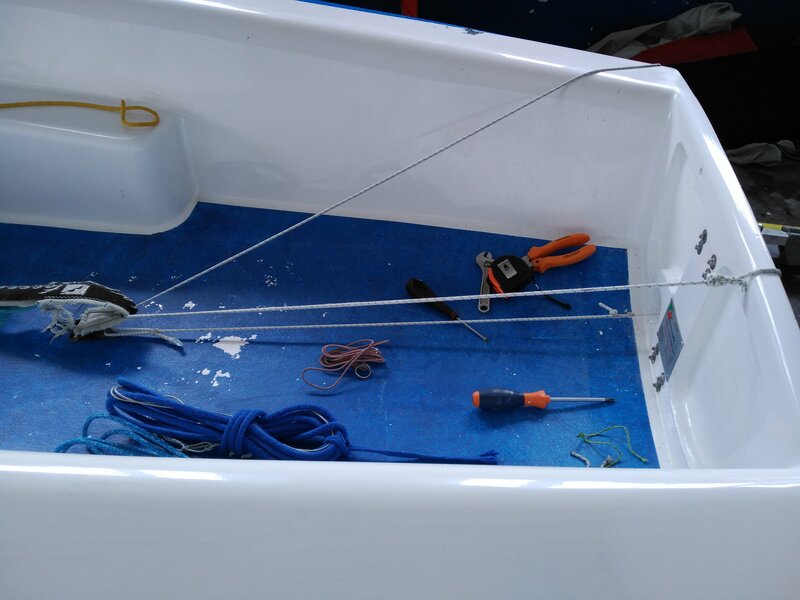 To do the repair right you should carefully remove the now soggy wood repair any underlying hull/trunk damage from the inside, replace wood, and re-glass. Fiddly and annoying but it's the real fix. For the time being you can patch with thickened epoxy and minimal glass to stem the flood. Also I may have a spare old thistle jib beyond it's racing lifetime so not worth much, If you cover shipping it's yours! (will verify it's still in my attic if you're interested) I also have "practice/bedsheet" grade spinnakers sitting in a bag..
Bottom looks good, no damage visible, just looks dirty to me. No roller or support in the vicinity. My glass repair skills are non-existant but I have a lot of experience with high-performance sealants. A paintable 100% solids urethane sealant should work well for a temporary fix. Should the centerboard retract all the way up into the hull? I have it pulled up as much as my rigging will allow. Thanks for the advice, friend, that doesn't sound too bad. I'm very interested in that jib if you can find it and a spinnaker, too. My mainsail is was used in the 1985 nationals going by the printing on the sail near the foot so an old jib would be no problem. I'm going to pm you my physical and email addresses and when you're ready to send just bill me through paypal, if you have an account. looks like there are spider cracks near the back of that slot. roughly under the damage inside so I think the boat had a fall in its history. If you're not a fiberglass efficinato I would leave it be (or find someone who is nearby) you can try your sealant skills in the meantime. Messaged you about the sails.. The centerboard looks line it's got an inch or so more to travel if the tackle isn't getting the job done you may need to move that eye in the cable forward a bit the board should retract until it's against the front of the trunk It's often close but should be fully retracted. edit: you can also do an additional wrap of the wire much easier then moving the eye! If you have the drum style wheel to raise the board, some boats use a purchase system others have the drum. Oh, okay, damage would have to be pretty bad for me to notice, I guess. I'll do my temporary fixes when the weather improves and go from there. Now that I know the centerboard should retract fully I'll work on it. I was more worried about it letting down fully and was relieved that it did. It's raining today so I'm not doing anything. Hoping to go back out on the water Friday. Got your message about the sails. Thanks! I suspect the Jordan ramps will be closed by high water from the rain. We have definitely gotten a lot of rain lately in the triangle. I've never put in at Jordan. Lake Wheeler, South of Raleigh, has excellent ramps and docks providing easy choices for getting under way and is just large enough to make for an interesting sail and is half the distance compared to Jordan. That's probably where I'll go on Friday. Out trying to sail again today but my temporary leak efforts have made the leak worse and in a different location. It was foolish of me not to repair that crack with my temporary material. I may try to make certain my temporary efforts at the other locations worked by slowly adding water to the inside of the hull until the leak sites are under and observe from below for leaks. I finally stumbled upon the identity of the logo on the mainsail of my Thistle. It appears to have been made by Shore sails. I've tried to get some history for this company but websites I've been able to access are from the early 2000s. Where can I get some information about this company? Here’s the link to the Carolina Sailing Club. We have a very active Thistle fleets well as several others. Our next race day is Sunday the 25th. 2 weeks ago we had 17 boats out. If your boat isn’t ready to race there is a scratch sheet where you can sign up as crew. I’m also PRO that day and you can sit on Race Committee if you would like. In the winter we sail out of Crosswinds Boating Center, the one owned by 2 thistle sailors. If you race actively during the winter you can keep the boat there mast up. In the summer we race out of Vista Point on Jordan Lake and Henderson Point on Kerr Lake. Just to let you know Racing has been cancelled on the 25th due to flooding at Jordan Lake. Next race day is Dec.2. Thanks, had planned to attend. Long range forecast looks dry on through next week so maybe see you next Sunday. Going to try Lake Wheeler tomorrow. Lake wheeler is ok if the wind is blowing down the lake /East or West and not across it. It's a very quick ride from one end to the other if there's more than 10kts. It also gets shallow quickly s you go west. My one and only successful sail was at Wheeler. Tried Crabtree last week but boat ramp dock was under water and another leak appeared so I scratched. I'm going to try Wheeler one day next week. I'm worried about the leaks and I hope I have them under control with my temporary measures. We'll see. I can't sail on crabtree. Most of the time the average depth is under 5'. The HS Team sails there and we are limited on where we can set up a race course because even the 420's will run aground in many areas. Thanks for that information about crabtree. I do remember now renting sunfish there and even they had trouble with lack of depth on some parts. Back at wheeler last week but it was just too windy with gusts I would guess at 15+ mph. The Thistle is probably too much boat for me to single-hand in that much wind right now and I made a mistake by trying to start from the windward side of the dock. A gust tipped the boat toward the dock as I was trying to board and I was only able to keep it from sinking by grabbing and pushing the mast back away from the dock. Seeing the edge of your boat going underwater is a sickening sight. I learned how long it takes to bail out about 1/3 of the inside volume after that. Waiting on another day this week with 6-8 mph winds forecast which is probably my limit right now. My list of things to do, and not do is getting pretty long but I feel I'm making progress.